Milan’s old canals are some of the most popular places for a walk, especially on sunny spring days. 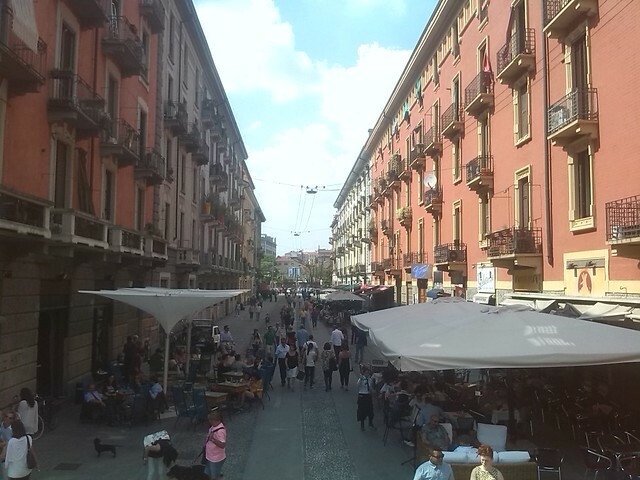 The quiet landscape contrasts with the popular image of Milan as a grey city: water, restaurants, and sometimes flowers or antique street markets fill the area with effervescent colors. This landscape is mirrored in the vibrant soundscape of Navigli—the name of the neighborhood through which the canals run. Few cars can pass through the narrow streets of this area that only recently was finally pedestrianized. Periodic honks signal minor gridlock that quickly vanishes, overwhelmed by the walking crowd. Other sounds suggest sweeter forms of mobility like a bicycle gently rolled by a walking cyclist, their passage on the cobblestones slight but still noticeable. For Italian speakers, the voices reveal important details about the area. 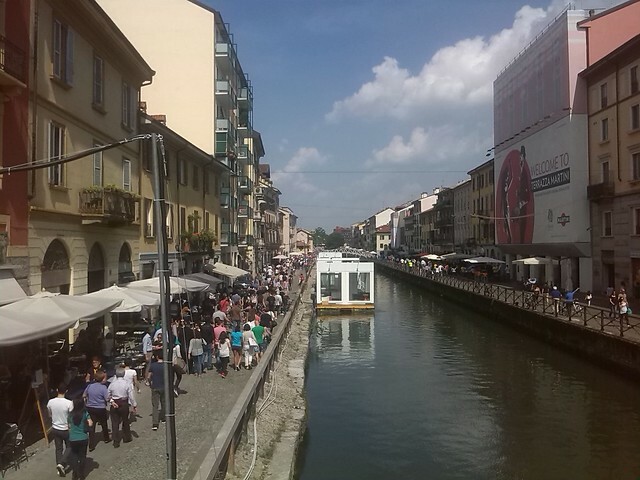 A mix of national and international accents demonstrates that Navigli is a popular area for tourists – be them families with dogs or foreign visitors coming to Milan for Expo 2015. The many cozy restaurants along the canals trap them in, as the clink of cutlery at the end of long lunches show. Other sounds are typical of the area, even if more difficult to record. The movement of the water against the banks can be heard especially when boats pass, while the stomping of people crossing the little iron bridge is a less pleasant sound. As the soundscape of Navigli suggests, this is a popular, easygoing, area to relax, take a walk and look at shop windows. The presence of the water and the colorful buildings along its banks make the area a landmark for Milan. It is a stark contrast from newer neighborhoods dominated by grey cookie cutter skyscrapers. At night, when this becomes one of the most popular areas to visit for a drink, loud crowds arrive in droves and the mellow feeling is lost. Its a reality local inhabitants always denounce. Post and Photos by Giovanni Vecchio. This is one of many posts where CoLab Radio contributors take readers and listeners on a soundwalk in their city. Read and listen to yesterday’s sound walk from Nashville, Tennessee here. If you’d like to submit an example from your own city, see the easy steps here.